Franciscan Sister Shirley Gerth shares that message on the website of St. Maurice Parish in Napoleon in southeastern Indiana, where she serves as its parish life coordinator (PLC). Those words show the purpose that has guided Sister Shirley in her interactions with people through the years. They also capture the blooming relationship that is developing between her and Franciscan Sister Donna Prickel, the parish life coordinator of Immaculate Conception Parish in Millhousen, which is just a few turns along country roads from St. Maurice. 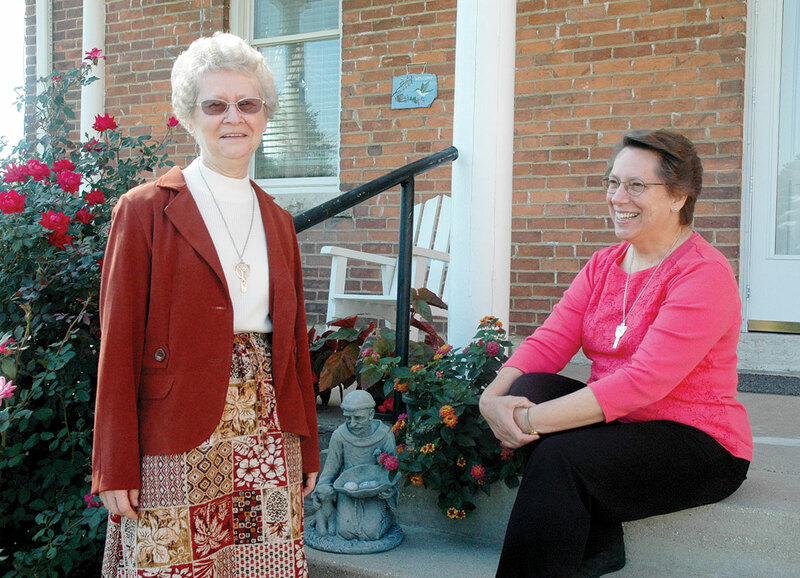 While Sister Shirley has been a part of the Franciscan community in Oldenburg for 55 years and Sister Donna has had that connection for 44 years, the two women are relative “strangers” because their faith journeys have led them in different directions—until now. Since the summer, their lives have become intertwined in their roles as parish life coordinators in the archdiocese. In her 25 years in that role, Sister Shirley has served the parishes of St. Anne in New Castle, St. Rose of Lima in Knightstown, St. John the Baptist in Osgood and St. Maurice. She also ministered in the former St. John the Evangelist Parish in Enochsburg. As for Sister Donna, she’s in just her third month as a parish life coordinator. The closeness of St. Maurice and Immaculate Conception parishes has led to a connection where Sister Shirley serves as a mentor to Sister Donna, but the roots of their relationship run far deeper—to their shared commitment to their Franciscan values. The Franciscan way of life attracted both sisters at an early age. “There were nine of us in my family,” says Sister Shirley, who is 72. “I knew my parents always prayed that one of their daughters would be a sister and one of their sons would be a priest. I did have a brother who was a priest, but he died. Neither has Sister Donna, who has previously served her Franciscan community by primarily working as a nurse for nearly 35 years, with many of those years in Michigan. “I also was from a large family,” says Sister Donna, who is 63. “I was the oldest daughter of 11 children. I grew up in St. Anthony of Padua Parish in Morris. I had the Franciscan sisters all through grade school and high school. We lived a half mile from the parish, and my parents always encouraged helping the sisters and the parish. Her life has changed since becoming a parish life coordinator. First, she had to move to a place where she didn’t know anyone—a transition that has been eased considerably by the way she has been “warmly embraced,” she says, by Immaculate Conception parishioners. She has also had to make a transition from being with people in a health care setting. In 25 years as a parish life coordinator, Sister Shirley has experienced all the roles and all the emotions of that relationship with parishioners. “A parish life coordinator does everything a priest does, except for celebrating Mass and the sacraments,” she says. “One of the joys of being a PLC is you enter people’s lives at all stages—as babies, as a young, engaged couple or with people dying. She shares the story of the relationship she developed with a woman, diagnosed with dementia, who had been in a nursing home for 10 years. Sister Donna has begun to experience that feeling as a parish life coordinator. It’s also become the message of the growing relationship between Sister Shirley and Sister Donna.